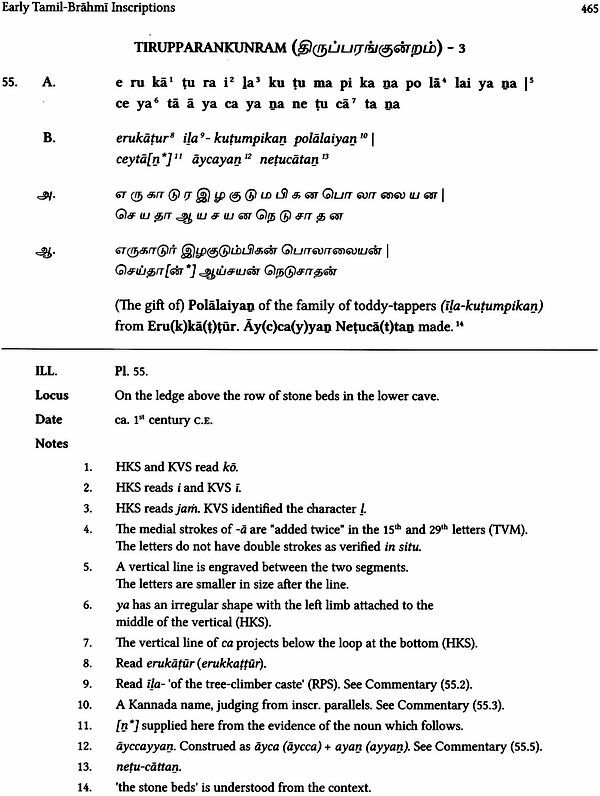 This is Volume I of the revised and enlarged Second Edition of Early Tamil Epigraphy, first published in 2003. The Volume deals with Tamil-Brahmi stone inscriptions discovered up to 2012. The main feature of the edition is that it is based on fresh in situ delineation and digitisation of the cave inscriptions included in the Corpus. This work provides a detailed account of the discovery and decipherment of the inscriptions and relates their language and contents to early Tamil literature and society. Tamil-Brahmi inscriptions on pottery, coins, seals and rings, have also been utilised to present a more complete picture of early Tamil epigraphy. Two new section deal with Prakrit inscriptions on pottery and other inscribed objects, and Sinhala-Prakrit pottery inscriptions, from Tamilnadu, which bring out the interaction of Tamil-Brahmi with other contemporary languages and scripts of South India and Sri Lanka. The study deals comprehensively with the epigraphy, language and contents of the inscription. The text are given in transliteration with translation and extensive word by word commentary. The inscriptions are illustrated with direct photographs in colour, together with delineations and estampages for comparative study. 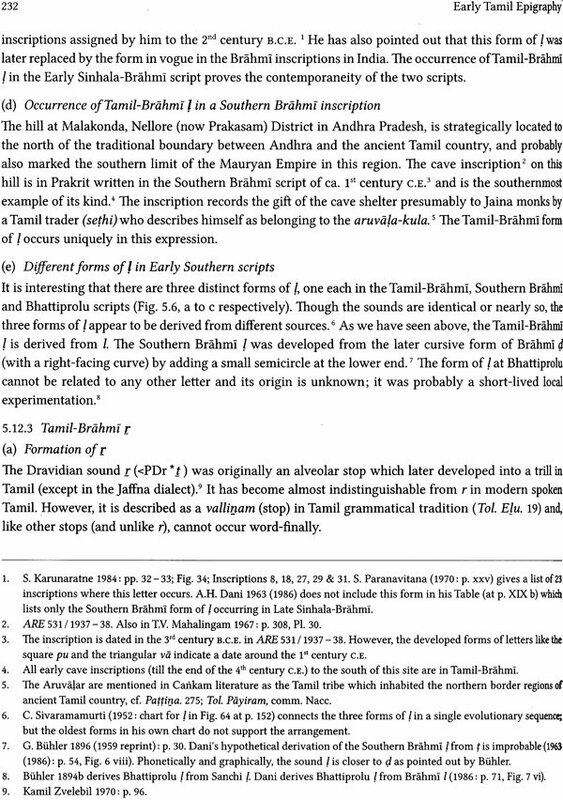 Palaeography of Tamil-Brahmi is described in detail with the help of letter charts. The special orthographic and grammatical feature of the earliest Tamil inscriptions are also described. A glossary of inscriptional words and several classified word lists have been added to aid further research. Iravatham Mahadevan (b. 1930) has published Widely on Indian epigraphy, especially on the Indus and Brahmi scripts. He was awarded the Jawaharlal Nehru Fellowship in 1970 for research on the Indus script and the National Fellowship of the Indian Council of Historical Research in 1992 for work on the Tamil-Brahmi inscriptions. His books, The Indus Script: Texts, Concordance and Tables (1977), and Early Tamil Epigraphy (2003) are recognised internationally as major source books for research in these fields. He has received many awards including, more recently, the title Tamil Chennai from the Madurai Kamaraj University (1995), the Copper Plaque of the Tamilnadu Archaeological Society (1998), the annual award of the Federations of Tamil Sangams of North America (2001), V. Chelvanayakam Award, Colombo (2004), the P.L. Gupta Medal of the Tamilnadu Numismatic Society (2006), the Madras Sanskrit College Centenary Award (2007), the Dravidian University Award for research publications in Dravidian languages (2008), Padma Sri by the President of India (2009), D. Litt degree by the Tamil University, Thanjavur (2009), Tiruvalluvar Award by the Government of Tamilnadu (2010), the Lifetime Literary Achievement Award by the Tamil Literary Academy, Canada (2010), Tolkappiyar Award (Presidential Award for Classical Tamil) for 2009 - 10 instituted by CICT and the Campbell Memorial Gold Medal for 2010 - 12 by the Asiatic Society of Mumbai for distinguished service in Oriental research. Iravatham Mahadevan joined the Indian Administrative Service in 1954 and retired voluntarily in 1980 to devote himself to academic pursuits. He lives in Chennai. The Central Institute of Classical Tamil takes great pleasure in bringing out the second revised and enlarged edition of Early Tamil Epigraphy by Dr. Iravatham Mahadevan. The first edition was published in 2003 jointly by Crea, Chennai, and the Harvard University, USA, including it in the Harvard Oriental Series. The book received international acclaim as the definitive study of early Tamil epigraphy. 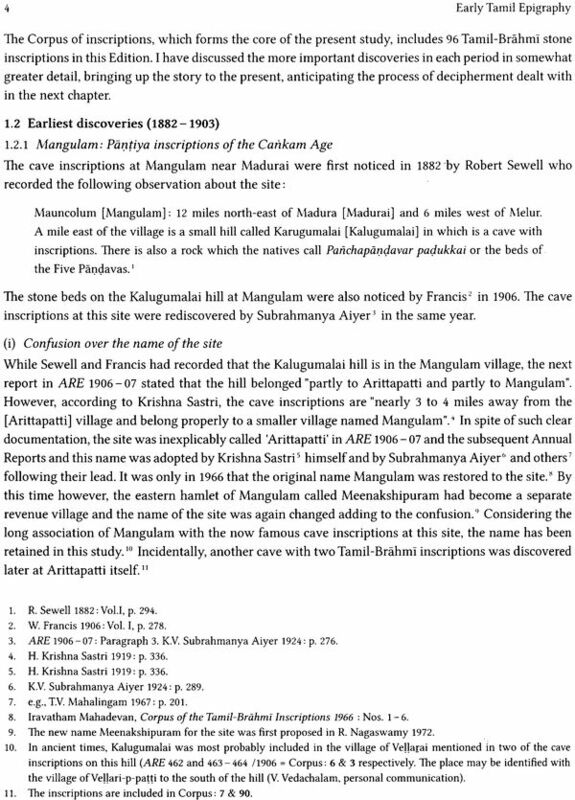 The present publication is part of a larger effort to document and construct a digital archive of all the Tamil-Brahmi Inscriptions in the caves of Tamilnadu and Kerala. This digital archive will be in the public domain coinciding with the launch of this book. It is significant that the author was inspired to write the second edition as a result of the digitisation effort undertaken by the Central Institute of Classical Tamil. This book, Early Tamil Epigraphy presents a comprehensive account of the origin, development, discovery and deciphering which began with the efforts of Shri K.V. Subrahmanya Aiyer in the 1920's. Some of those ideas have been expanded on and revised by the next generation of scholars, in particular the author of this book. The book is at once a lay person's guide, a researcher's reference tool, a student's text book - a very comprehensive edition. Part I of the book deals with the discovery and deciphering, language and polity in the context of early Tamil epigraphy. Part II of the book deals with the technical aspects of epigraphy - in particular palaeography, orthography and grammar. 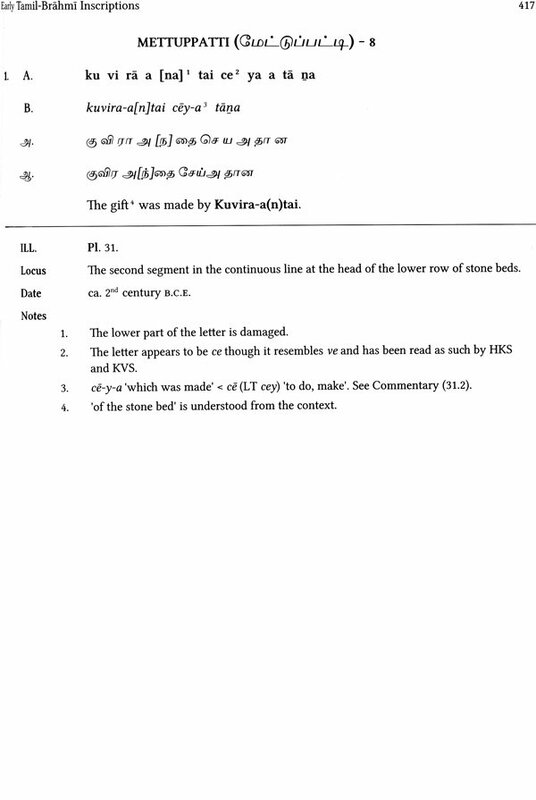 Part III presents the comprehensive corpus of Tamil-Brahmi stone inscriptions. The concluding section is an exhaustive commentary and a word-by-word analysis of the inscriptions. The book also includes a selection of Tamil-Brahmi inscriptions on pottery, coins and seals found in Tamilnadu and elsewhere. The book correlates the development of Tamil Language with inscriptions found in other languages and scripts in Tamilnadu in the same period. The Central Institute of Classical Tamil is sure that this volume will be an invaluable record of the priceless heritage that not only people interested in Tamil studies will appreciate but any reader will cherish. The Central Institute of Classical Tamil is proud to present this masterpiece to the Tamil World. Narayana Singh, Director, and Prof. K. Ramasamy, Deputy Director, CIIL, to take up the documentation of the earliest inscriptions in Tamil, employing the best available digital technology. The proposal was accepted which is the genesis of the present publication. It is my duty to thank the Director, CIIL and his colleagues for their invaluable help in initiating this project. The Central Institute of Classical Tamil (CICT), Chennai, was established in 2007 to implement the Central plan schemes for promoting research in Classical Tamil. One of the first, and still the largest, projects implemented by CICT is the documentation of the earliest Tamil inscriptions and heritage monuments on HD Video and High Resolution still imagery, indexed, catalogued and held as a digital archive by CICT. 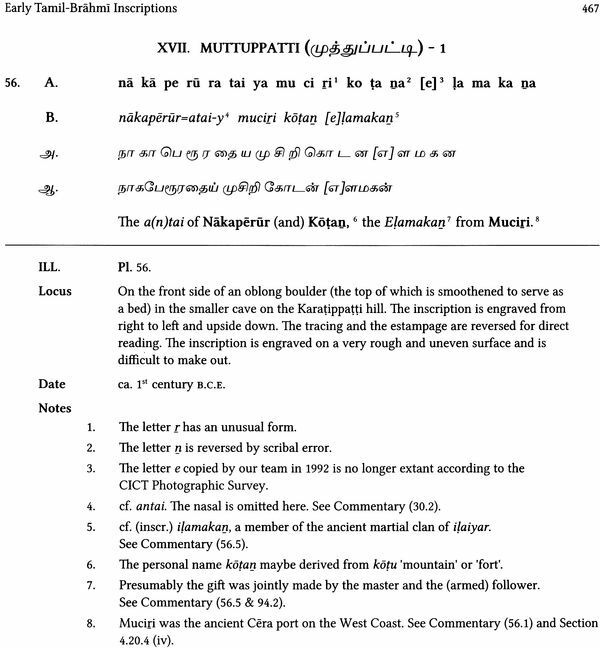 Even as this long-term programme got under way, I was invited by CICT to prepare a revised edition of my book, Early Tamil Epigraphy (first published in 2003), dovetailing it with the ongoing documentation of Tamil-Brahmi and Vatteluttu stone inscriptions. I need hardly add that I accepted the offer with alacrity as it would bring to fruition the project I had only dreamt about for long. I am thankful to the Director, CICT, for implementing the scheme for documentation of the earliest Tamil inscriptions and for including the revised edition of my book within its scope. The CICT entrusted the execution of the project to the Centre for Plants, People and Ecosystems (CPPE), Chennai, a non-profit organisation working in this field. The CICT project team constituted by CPPE started the work in December 2007 and successfully completed most of the field work by the end of 2010. I am thankful to M. V. Bhaskar, Project Coordinator, and his colleagues for the efficient execution of the project. I was happy to inaugurate the work at Mamandur, but could not participate in further field work due to health problems except once at Pulankurichi in 2010. The team led by Bhaskar completed the field work on its own with a copy of Early Tamil Epigraphy to serve as the guide to locate the caves and inscriptions. I was shown the results of the photographic survey for verification of the in situ delineations, enlarged on the computer screen. I could hardly believe my eyes, looking at the amazingly clear photographs of the caves and the remarkable accuracy of the delineations. I could sense that it is not only the superior technology but also the total involvement of the team in the project, which produced such excellent results. I am proud to have been a member of the team, though working from only behind the scenes. It has taken me more than two years (2010 - 12) to complete editing the present publication which includes only the Tamil-Brahmi inscriptions. I must again thank Bhaskar for personally undertaking the laborious and time-consuming task of typesetting the revised edition afresh in Unicode. I have received help from a large number of institutions and scholars for my research as acknowledged by me in the first edition of the book. I shall have to confine myself to thanking those who directly contributed to the making of the present, revised edition. My thanks are due to Prof. V.C. Kulandai Swamy, closely associated with the movement to secure Classical status for Tamil, for his constant encouragement and guidance. Prof. R. Champakalakshmi, to whom I could always turn for guidance in any matter related to South Indian history and culture. Dr. R. Krishnamurthy, the doyen of South Indian numismatics, for helping me with the selection of coins with Tamil-Brahmi legends discovered and deciphered by him. Prof. P.R. Subramanian, for patiently answering my innumerable queries related to Tamil and Dravidian linguistics. Prof. K Raj an, for generously making available photographs of the Tamil-Brahmi herostone inscriptions discovered by him, and of the pottery inscriptions from Kodumanal, Porunthal and other recent excavations led by him. Dr. S. Vasanthi, Director, Tamilnadu State Department of Archaeology, for making available photographs of pottery inscriptions from the recent excavations by the Department. Mr. G. Sundar, Director, Roja Muthiah Research Library, Chennai, for giving me access to rare publications in the holdings of the Library, and helping me to compile the enlarged bibliography in the present revised edition. The present publication marks the culmination of my study of Tamil epigraphy extending over more than half a century (1958 - 2012). Looking back over this long period, I remember with gratitude Dr. C. Sivaramamurti, who initiated me into the discipline of epigraphy, Prof. KA. Nilakanta Sastri, who suggested to me to take up the research on the cave inscriptions of Tamilnadu, and KV. Subrahmanya Aiyer, the founder of Tamil-Brahmi epigraphy, whom I had the good fortune to meet in 1966 and receive his blessings for my successful decipherment of the Tamil- Brahmi cave inscriptions of the Cankam Age at Mangulam and Pugalur. It is time to hand over the baton to younger scholars in the field. 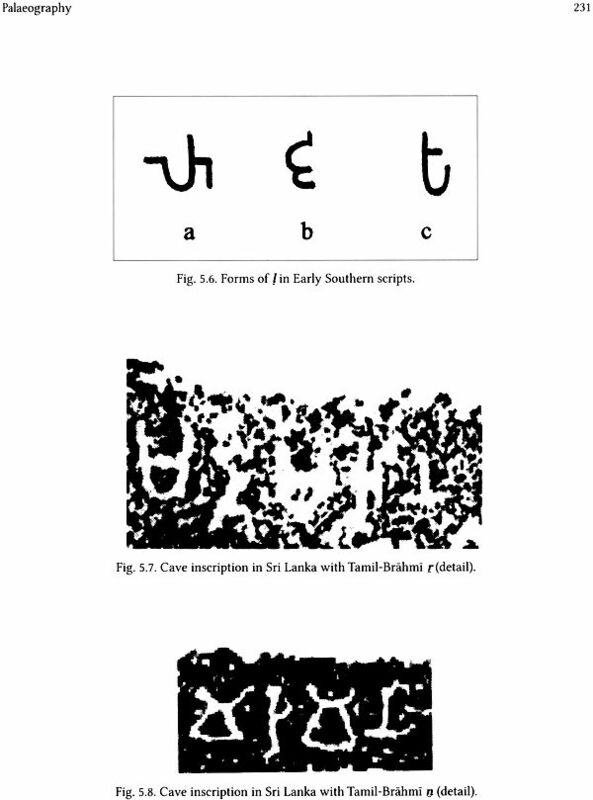 Early Tamil Epigraphy: From the Earliest Times to Sixth Century A.D. (henceforth EYE) was first published in 2003, in separate but identical editions, by Cre-A:, Chennai in India and the Department of Sanskrit and Indian Studies, Harvard University, USA. The book has been well received by scholars and students alike, as indicated by the large number of reviews in academic publications in India and abroad, and by the fact that the Indian Edition was sold out within a year of its publication. Two seminars were held in 2004 on the progress in Tamil-Brahmi studies and related areas, one by the Madras Institute of Development Studies (MIDS), Chennai, and the other at the Tamil University, Thanjavur. An increasing number of publications on Tamil-Brahmi have appeared in recent years in Tamil and English attesting to the heightened interest in this developing field. I am gratified that the main objectives of the book to provide reliable documentation and a definitive edition of the texts of the Tamil-Brahmi cave inscriptions have been substantially fulfilled. The Revised and Enlarged Second Edition is being published by the Central Institute for Classical Tamil (CICT), Chennai, an autonomous institution functioning under the Department of Culture, Ministry of Human Resource Development, Government of India, New Delhi. The CICT is implementing an ambitious programme for the digitisation and preservation of Classical Tamil texts and survey of heritage monuments. 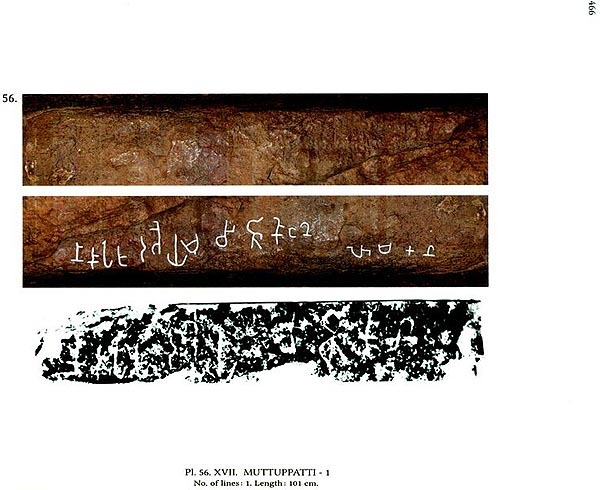 One of the projects included in this larger programme is the documentation of Tamil-Brahmi cave inscriptions. The CICT has entrusted the execution of the project to the Centre for Plans, People and Ecosystems (CPPE), Chennai. The technical details of the project and consequent improvement to the quality of documentation are described by M. V. Bhaskar, Project Co-ordinator, in his 'Report on the CICT Photographic Survey' included in this volume (pp. 123 - 136). The critically important feature of the project is replacing the Plates produced from the manual tracing of the inscriptions in EIE 2003, with in situ delineation and digitisation. A welcome bonus is that the current Edition has an electronic counterpart with many interactive features for the reader, facilitating an even closer study of the inscriptions (See Plates 1 - 96). The present publication, Volume I of the Revised and Enlarged Second Edition, deals only with Tamil- Brahmi inscriptions including the newly discovered stone inscriptions (Nos. 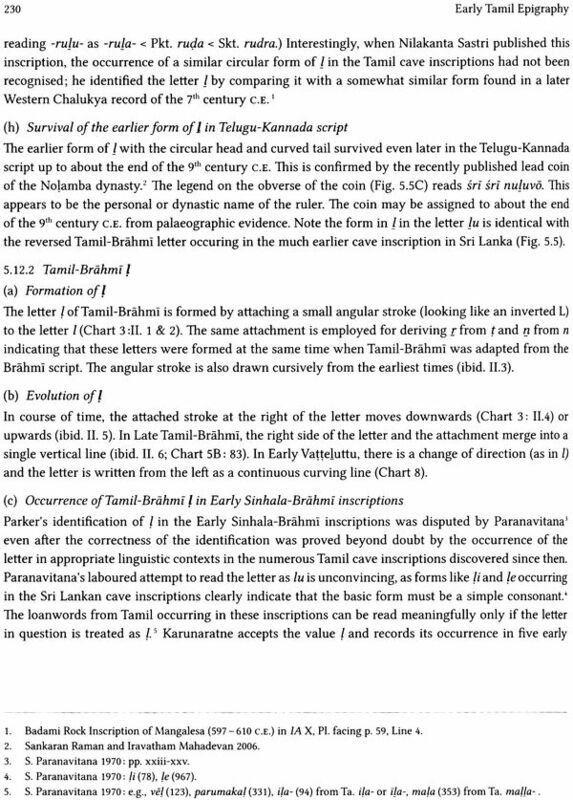 90 - 96) and, selectively, other Tamil-Brahmi inscriptions on pottery, coins, seals and rings (Annexure A to Chapter 1). Two new Sections have been added dealing with Prakrit inscriptions on pottery and other inscribed objects and, Sinhala-Prakrit inscriptions on pottery, both from Tamilnadu (Annexures B & C to Chapter 1). I hope that the additions will lead to a wider and deeper perspective on early Tamil epigraphy and its interaction with other contemporary languages and scripts in South India and Sri Lanka. This volume retains the basic format of EYE 2003 in the numbering of the Tamil-Brahmi stone inscriptions in the Corpus and of the inscriptional words in the Commentary to maintain continuity and facilitate citation. Newly added Tamil-Brahmi stone inscriptions are placed in the Addendum to the Corpus and allotted new Reference Numbers in continuation of those in EYE 2003. 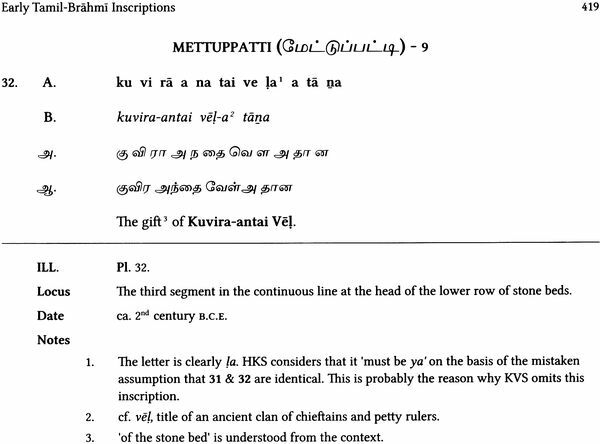 Early Vattteluttu inscriptions included in EYE 2003 have been omitted from the present volume to provide more space for the additional material on Tamil-Brahmi. Further, to do full justice to Vattteluttu will need a separate volume. The proposed volume would also include more Early Vattteluttu inscriptions, especially the two long inscriptions from Pulankurichi and hero stone inscriptions up to 6th century C.E., which could not be accommodated in ETE 2003. 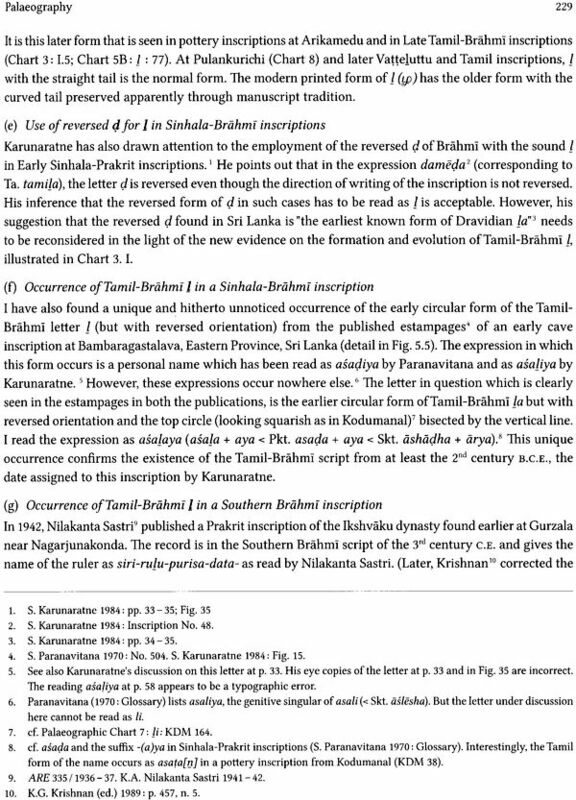 However, the brief account on the origin, evolution and decline of the Vatteluttu script included in the survey of early Tamil epigraphy has been retained in the present volume to provide the link between Tamil-Brahmi and Vatteluttu scripts. I am happy to report that the delineations reproduced in the present volume have confirmed the accuracy of the earlier tracings in ETE 2003 with but a single exception. The first two letters in an inscription (No. 27) which were earlier traced as a single broken letter ma', have now been corrected as u ta in the personal name Uttiraantai. There are some other minor variations like, for example, the addition of the medial vowel marker -ii (No. 24), the suffix -i (No. 48), and the pulli (No. 68), which do not, however, materially alter the readings or interpretations. There are also a few cases (Nos. 10 & 15) of letters missing, wholly or partly, due to disintegration of the rock surface by natural or manmade causes. Each such variation, however minor, between the earlier tracings and the present delineations, has been recorded in the footnotes under the respective inscriptions in the Corpus. The newly added Tamil-Brahmi inscriptions include four on hero stones (Nos. 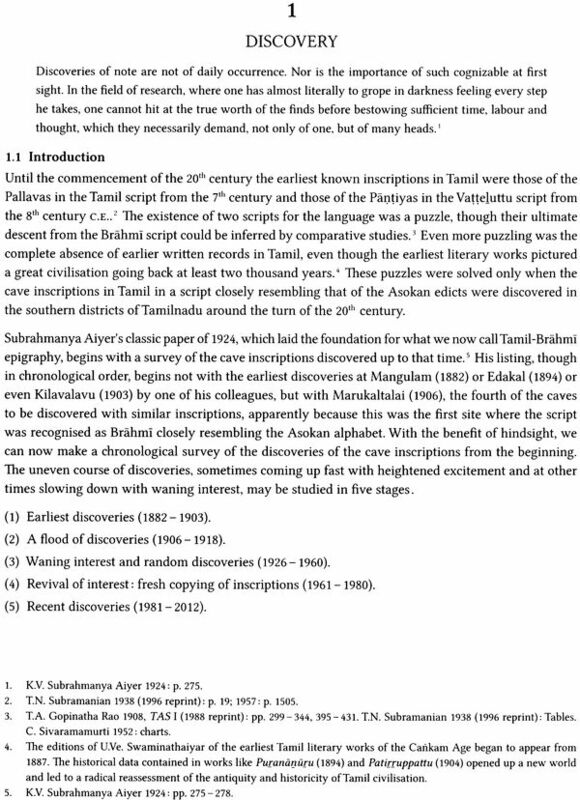 91 - 94), marking a major turning point in the history of early Tamil epigraphy. K. Rajan and his colleagues in the Tamil University, Thanjavur, discovered the inscribed hero stones in 2006 in megalithic urn-burial fields in two villages in the upper Vaigai valley. 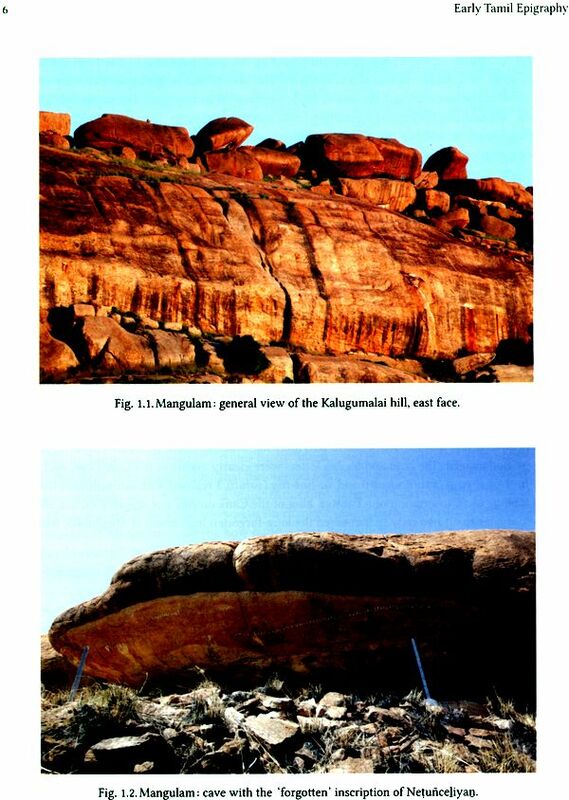 This important discovery extends the Tamil-Brahmi period into the late megalithic age linking the latter with the succeeding early historical period attested in the Tamil Cankam poetry. The inscriptions, especially the one (No. 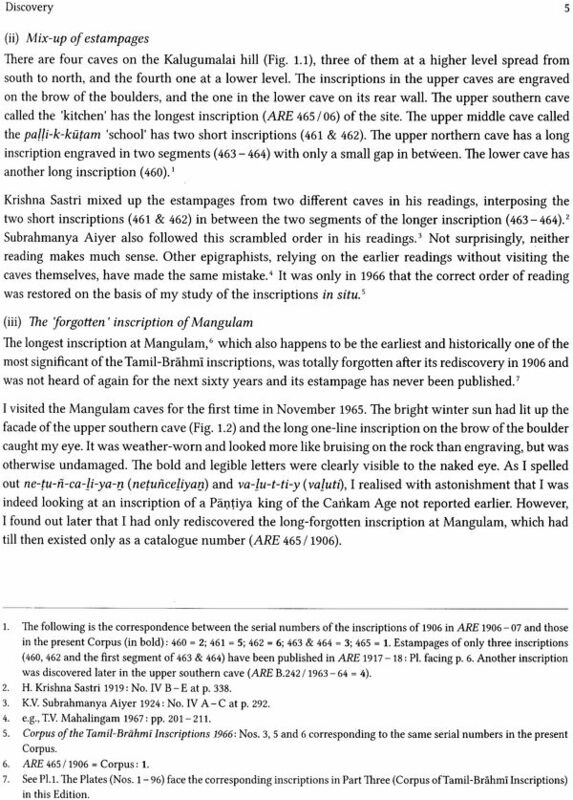 93) mentioning a cattle raid (a-kol), corroborate the vivid accounts of erecting herostones in Tolkappiyam and the Cankam anthologies. It is significant that the language of the Tamil-Brahmi hero stone inscriptions has no Prakrit element and the contents do not reveal any association with Jainism. 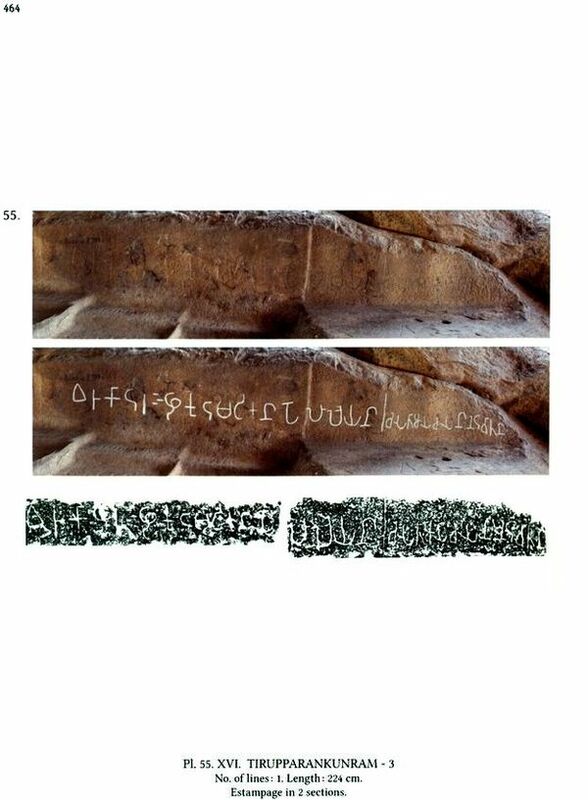 The newly discovered Early Tamil-Brahmi inscription (No. 95) in a cave on the Samanarmalai hill at Kilkuyilkudi near Madurai is also of exceptional interest. The location forms part of the extensive complex of caves marking the earliest settlement of Jaina monks in the Pantiya country. Samanarmalai is also associated with the famous Jaina monastery (no longer extant) at Tirukkattampalli, which was considered to be the central seat of authority for the Jainas of the Tamil country (p. 172). Yet another interesting Tamil-Brahmi inscription (No. 96) from Edakal in Kerala, was discovered most recently (2012) by M. R. Raghava Varier. This is a brief label inscription affixed to an anthropomorphic figure forming part of the prehistoric rock art in the cave. I have read the inscription as i palama 'this (is) ancient', and identified it as the earliest known inscription in Malayalam, dated in the 4th or 5th century C.E. Among the newly discovered Tamil-Brahmi pottery inscriptions included in the present volume (Catalogue AI, Chapter 1), the most significant are those from the recent excavations at Pattanam in Kerala, identified with Muciri, the ancient seaport of the Cera rulers and main entrep6t for trade with the West in classical times. Kodumanal (ancient Kotumanam) in Tamilnadu continues to be a veritable cornucopia of Tamil-Brahmi pottery inscriptions, yielding hundreds in each session of excavation, but represented in this volume only by a few examples for want of space. The extraordinarily high numbers of Tamil-Brahmi pottery inscriptions offer the most conclusive evidence for widespread and popular literacy in the Tamil society of the Cankam Age. More Tamil-Brahmi pottery inscriptions have been found from recent excavations outside India. Pride of place among them must be given to the inscription reading tirali muri 'written agreement (by) the assembly' found at Tissamaharama in southern Sri Lanka, which has been assigned to 200 B.C.E. ( 0.20, Catalogue AI, Chapter 1). The evidence it provides for the existence of a trade guild of Sri Lankan Tamil merchants at this site known for its prolific yield of gemstones, is noteworthy. Perhaps it is this trade guild which issued the lead coins or tokens with Tamil-Brahmi legends found earlier near this site (Nos. 7 - 10, Catalogue AII, Chapter 1). Other ancient sites abroad which have yielded Tamil-Brahmi pottery inscriptions from recent excavations are Queseir al-khadim and Berenike on the Red Sea Coast of Egypt, Oman in the Southern Arabian Peninsula and Thailand in South East Asia (Catalogue AI), providing new evidence for the extensive maritime trade by the Tamils of the Cankam Age. Special mention must also be made of the discovery of a gold ring at Karur with a Prakrit legend assigned to 1st century B.C.E. on palaeographic evidence (Fig. 5.2A, p.212). 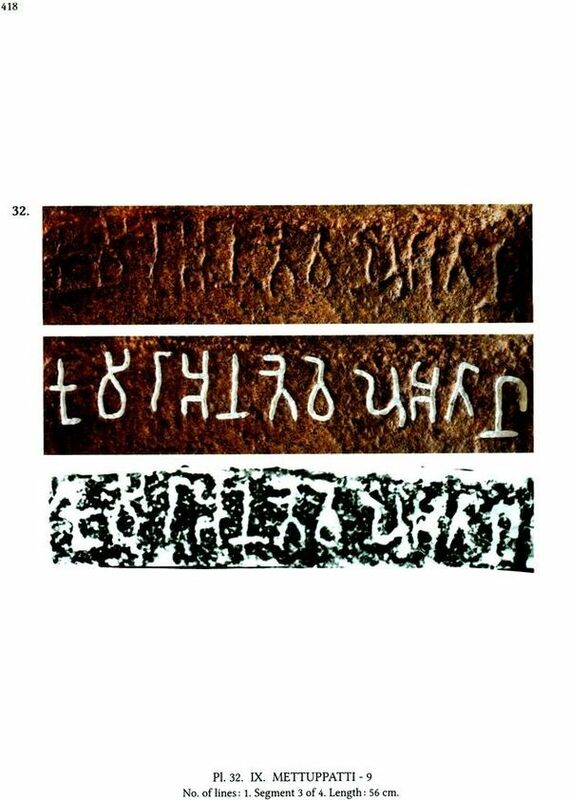 The most remarkable feature of the legend on the ring is the occurrence of the special -ii medial vowel marker, the diagnostic feature of the Bhattiprolu script, for the first time outside the Stupa site in Andhra Pradesh. The unexpected find coming more than a century after the discovery of the casket inscriptions at Bhattiprolu offers good evidence for the connection between the earlier TB-I orthographic convention of Early Tamil-Brahmi inscriptions and the later orthographic convention of the Bhattiprolu script (see discussion pp. 266 - 269). 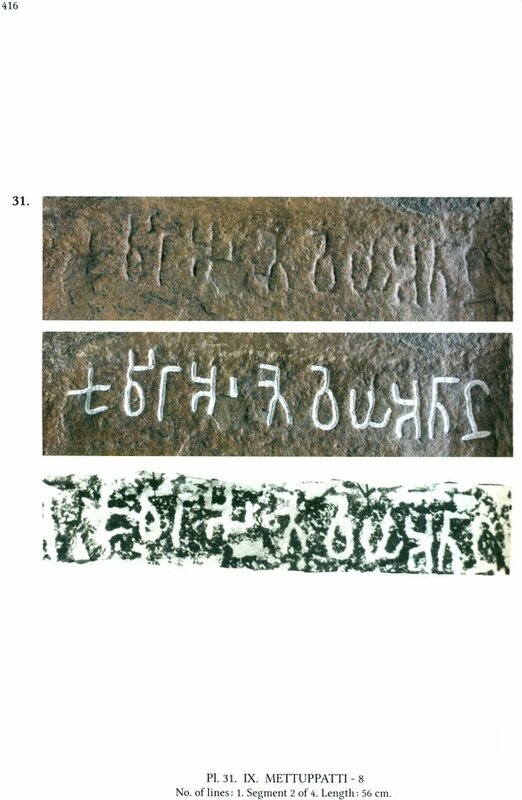 Even as the manuscript of the present volume was getting ready for the press, more discoveries of Tamil-Brahmi inscriptions have been reported including yet another caveside inscription from Tirupparankunram, another hero stone inscription at Porpanaikkottai near Pudukkottai and further quantities of Tamil-Brahmi pottery inscriptions from the inexhaustible trenches at Kodumanal. It has not been possible to include these recent discoveries in the present volume. I hope Early Tamil Epigraphy will develop into an open-ended, multi-volume series, arranged thematically and updated periodically, to keep abreast of the ever increasing number of discoveries in this field.